Don't you hate those plastic diapers under a cute baby dress? And when baby is on the move it seems it is always showing! This adorable 65poly/35 cotton, eyelet trimmed, double seated bloomer will add the finishing touch to your little girl's look! 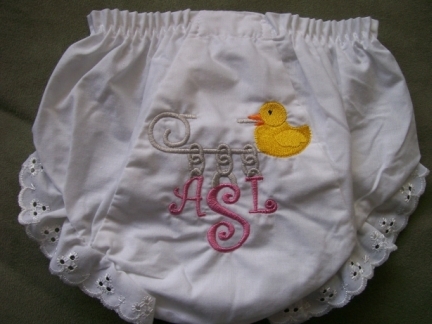 It features your little one's initials hanging in monogram style (last initial in the middle) from a cute diaper pin! Oh, so chic! You choose initial colors. Duck, star, heart, or traditional diaper pin are available.